Pod Container Container Pod one or more application containers that are tightly coupled, sharing network and storage. Example: a web front-end Pod that consists of an NGINX container and a PHP-FPM container with a shared unix socket and a “init” container to transform their config files based on environment variables. Container Container Container Container Pod ReplicaSet Pod ReplicaSet Extends Pod resource to run and maintain a specific number of copies of a pod. Deployment Container Container Container Container Pod ReplicaSet Deployment Pod a controller that ensures a set number of replicas of a Pod is running and provides update and upgrade workflows for your Pods. 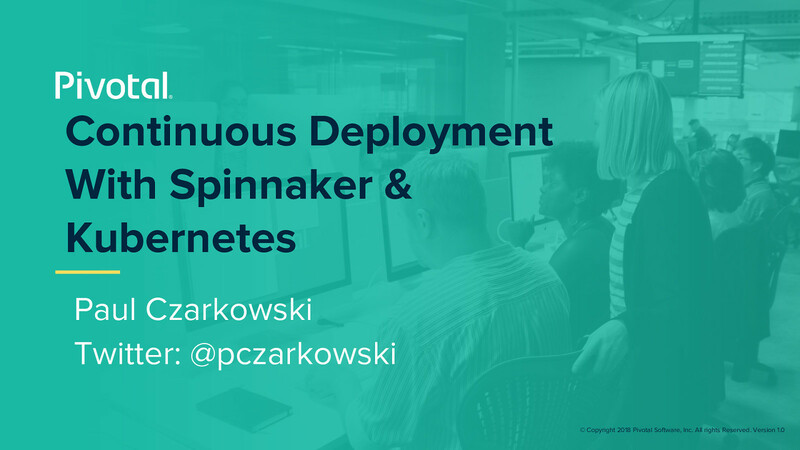 Example: cloud native Node app that scales horizontally and upgrades 2 pods at a time. statefulset Container Container Container Container Pod ReplicaSet Deployment Statefulset Pod a controller that manages stateful application Deployments by providing sticky identity for pods and strict ordering and uniqueness. Example: Cassandra database. First pod is ‘cassandra-0’ thus all other pods in the set can be told to cluster to ‘cassandra-0’ and it will form a ring, plus the storage will survive pod restarts. 192.168.0.5:4530 192.168.0.6:4530 K8s Worker K8s Worker Service app=bacon 10.3.55.7 Service track Pods based on metadata and provides connectivity and service discovery (DNS, Env variables) for them. Type app=bacon Pod app=bacon Container Container Container Container Pod NodePort extends ClusterIP to expose services on each node’s IP via a static port. 33.6.5.22:80 Load Balancer 192.168.0.5:4530 192.168.0.6:4530 K8s Worker K8s Worker track Pods based on metadata and provides connectivity and service discovery (DNS, Env variables) for them. Service app=bacon Service 10.3.55.7 Type app=bacon Pod app=bacon Container Container Container Container Pod LoadBalancer extends NodePort to configure a cloud provider’s load balancer using the cloud-controller-manager. https://example.com Ingress /bacon Service app=bacon eggs Service app=eggs Ingress a controller that manages an external entity to provide load balancing, SSL termination and name-based virtual hosting to services based on a set of rules. Volume Is [effectively] a Directory, possibly with data in it, available to all containers in a Pod. Container Usually Shares lifecycle of a Pod (Created when Pod is created, destroyed when Pod is destroyed). Persistent Volumes outlive Pods. Container Pod Can be mounted from local disk, or from a network storage device such as a EBS volume, iscsi, NFS, etc. Transforming How The World Builds Software © Copyright 2018 Pivotal Software, Inc. All rights Reserved.